Hi, I am interested in your 1969 Volkswagen Karmann-Ghia (stock #MHM3180) listed on Autotrader for $15,900. I'd like to get more information about this vehicle and confirm its availability. Worldwide Vintage Autos is pleased to present this 1969 Volkswagen Karmann Ghia. The Volkswagen Karmann Ghia is a sports car marketed in 2+2 coupe (1955 1974) and 2+2 convertible (1957 1974) body styles by Volkswagen. 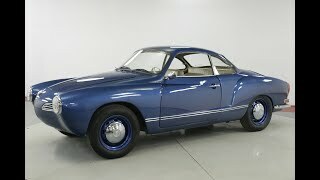 Internally designated the Typ 14, the Karmann Ghia combined the chassis and mechanicals of the Type 1 (Beetle) with styling by Italys Carrozzeria Ghia and hand-built bodywork by German coachbuilding house, Karmann.